Intel's main focus at this year's CES show seems to be ultrabooks. Hexus reports the chip giant showed off several impressive systems, including models with Kinect-like gesture/voice control and hands-free gaming, but also Nikiski, an ultrabook with tablet-like functionality. 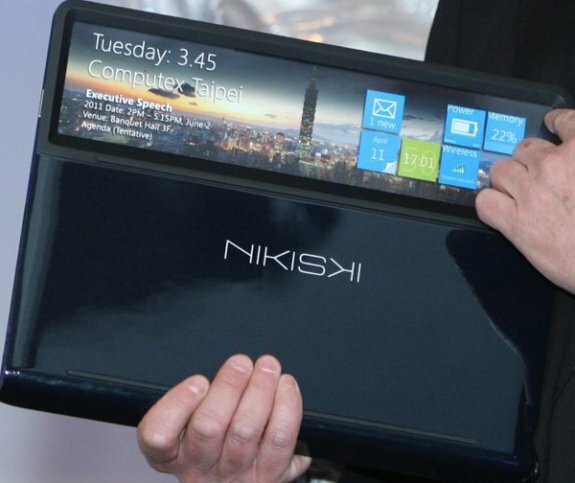 Mooly's final demonstration was a functional concept he called 'Nikiski', an Ultrabook featuring a transparent mouse-pad spanning the width of the device, when closed, the pad made it possible to continue to view the top-third of the device's screen, with the pad acting as a touch-screen interface, enabling the user to view and interact with a custom Metro UI app for quick access to social media and important information without the need to open up the Ultrabook. Though in the early stages, regardless of how useful the technology proves to be, it's certainly an impressive concept, with the overall theme of the event clearly focusing on cramming as many features as possible into the super, or rather 'ultra' thin devices to offer maximum choice in how to enjoy and appreciate the user experience.